Cafe Del Mar Pattaya is the place to eat, drink and listen. Original home to the daily Sunset Sessions, expect great food, drinks and days of lounging in the sun with the perfected beach soundtracks. 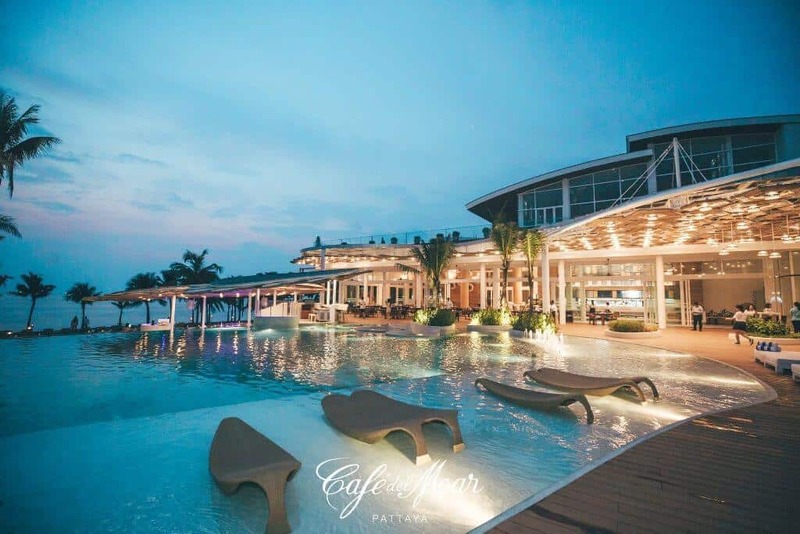 Cafe del Mar Pattaya is the perfect place to spend the entire day and allows guests the perfect opportunity to eat, drink and listen. Open daily from 11 am, it offers a 200-seat restaurant and 100 oversized daybeds around a fun-sized infinity pool, looking over its very own beachfront. It features a premium casual restaurant offering indoor and outdoor dining, demonstrating a mix of Café del Mar’s Mediterranean style with local Thai influences. Café del Mar is well known locally for music and provides a unique blend of House, Nu Disco and Balearic Sounds, mixed by a lineup of rotating local and international DJs. Following the daily arrival of the sunset, Café del Mar Pattaya is the Original Sunset Session, which kicks off at 5 pm. Dancers, musicians and a special DJ set to guide the beautiful imagery of the sinking into the Gulf of Thailand. An eye-catching brand’s signature Fire Show performance accompany the scene. There are changing rooms, showers, lockers, multiple dining options, signature entertainment and a vibe that evolves throughout the day, keeping things interesting and exciting well into the night time.